Learn how to decorate your Christmas tree beautifully and affordably with these step-by-step tips! 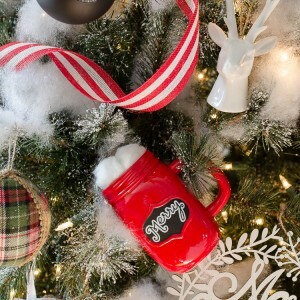 This is a fun sponsored post by Scentsicles because scents of the season matter. All words, pictures, and opinions are my own. 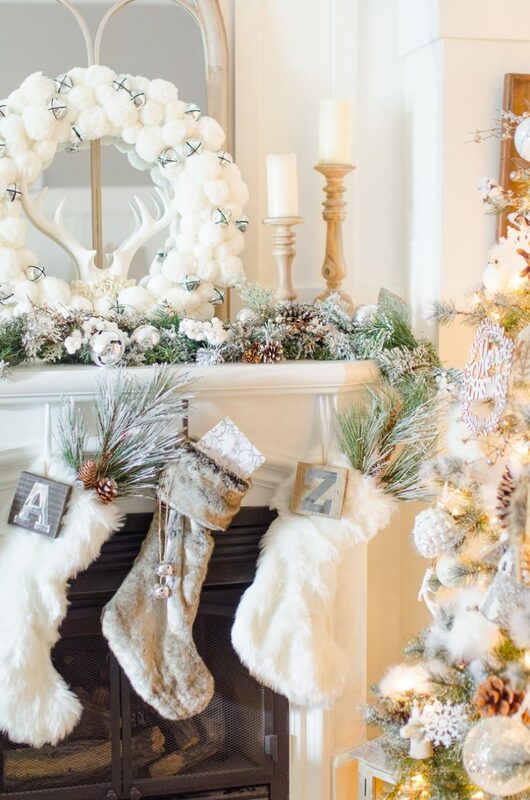 Decorating for Christmas is something I look forward to all year long! 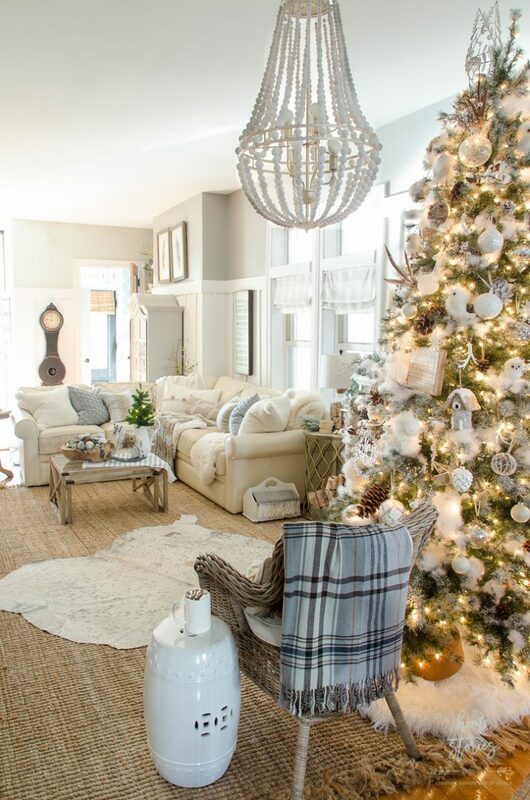 I love the challenge of transforming the same space into a different kind of Christmas wonderland every year. Perhaps I come by it honestly. Growing up, our family typically had three decorated Christmas trees. One tree was the “kids’ tree” sporting colored lights, popsicle stick ornaments, and an anything goes vibe. Our main tree was the “family tree” with cozy handmade and purchased ornaments, strings of popcorn & cranberries, and plaid ribbon bows. The third tree was the pièce de résistance–my mom’s formal tree. This tree had a tight color palette, approachable elegance, and gorgeous ornaments. 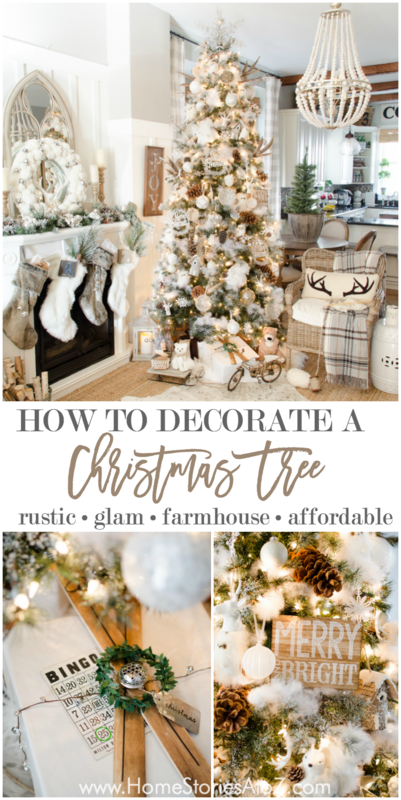 Over my lifetime I’ve learned a thing or two about how to decorate a tree, and I am confident that whether your style is eclectic, farmhouse, or glam, obtaining a curated look for your Christmas tree is doable! I’m going to share my best tips, hints, and tricks with you on how to decorate your Christmas tree affordably and beautifully this season. 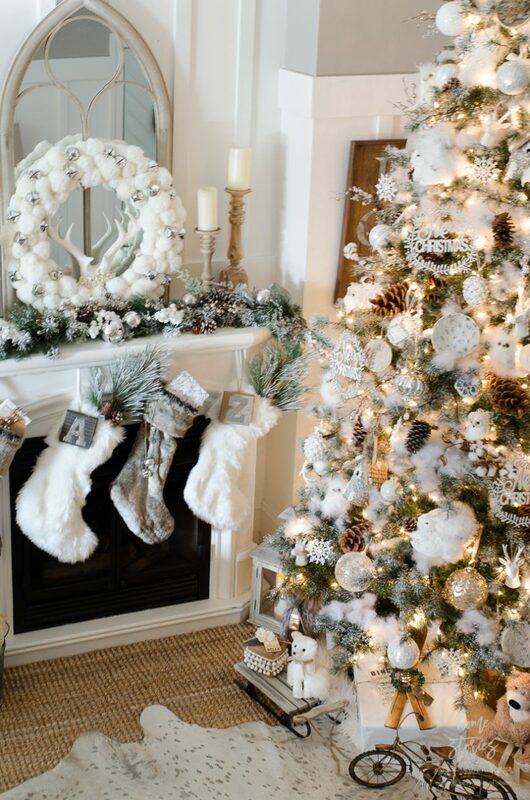 Tip 1: Artificial trees are easier to decorate than live trees. Up until last year, I was a live-tree snob. I’ll admit it. I LOVE the smell of a live Christmas tree. The smell of fresh greenery is synonymous with Christmas for me, and I just couldn’t imagine the holiday without it! However, something I didn’t know is that live trees are kind of a nightmare to decorate. After my gorgeous live tree attempted suicide in the middle of the night–and made casualties out of most of my favorite ornaments–I lost some of my affinity for live trees. 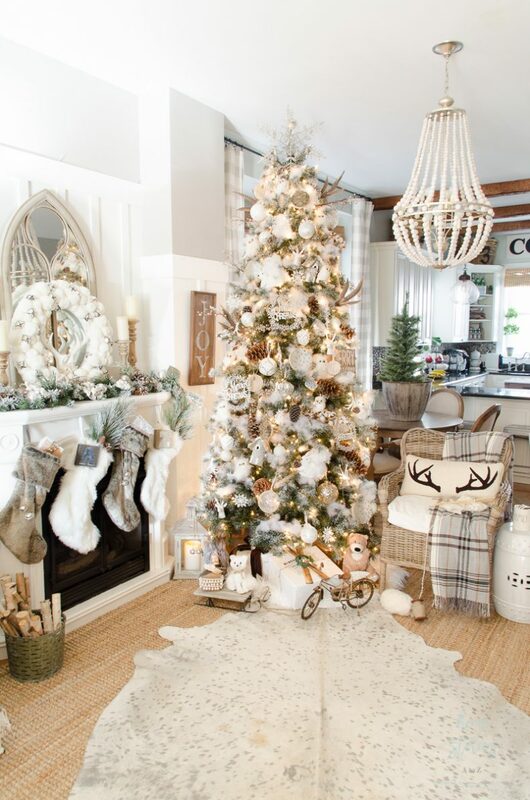 Can you obtain a decorator’s look with a live tree? Absolutely. However, it will be much more difficult and your tree might fall over in the middle of the night due to the weight of the ornaments. Trust me on this one. Faux is the way to go! Tip 2: If your tree is not pre-lit, place lights on tree first and then use a bag of Poly-fil batting to create faux snow. My tree is lightly flocked, but I prefer the look of a tree that’s been through a heavy snowstorm! I grew up on the shores of Lake Michigan where the woods meet the lake, and every winter the forest transformed into a fairyland. 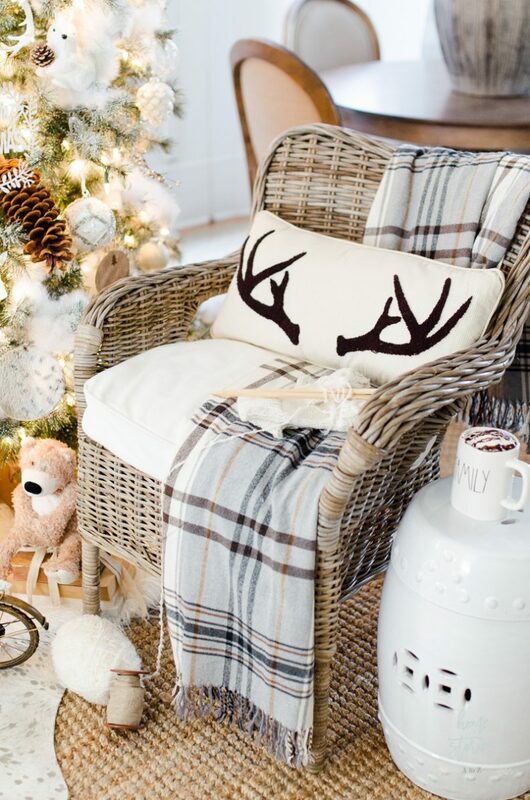 You can achieve this winter wonderland look at home with a simple bag of Poly-fil batting . Take handfuls of Poly-fil and place it on the outer branches of your tree where snow would naturally fall. It’s an inexpensive way to add instant character to your tree! Tip 3: Pick your color scheme and your focal point. 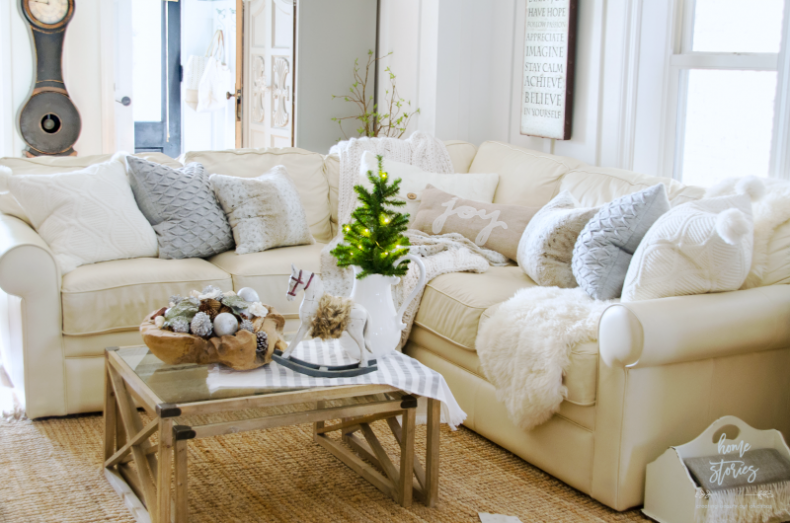 Whether it’s a tree or a room, decorating with a tight color palette will always yield a polished look! Pick two or three colors and shop the store (and the house!) with your palette in mind. This year, I knew that I wanted to decorate with soothing neutrals. I decorated with traditional reds, greens, and plaids last year so wanted to go in the opposite direction this year. Neutrals can sometimes feel a bit formal, so I incorporated a lot of furry things and woodland creatures to create a cozy, kid-friendly vibe. With my color scheme in mind, I purchased ornaments from Target, HomeGoods, Joann’s, the Dollar Store and Michaels and added some organic and handmade ornaments into the mix. When buying large ornaments, purchase at least three to place on the tree. An odd assortment of large ornaments looks best on the tree. Although your tree will look best decorated on all sides, chances are good your tree will have a “main” side. 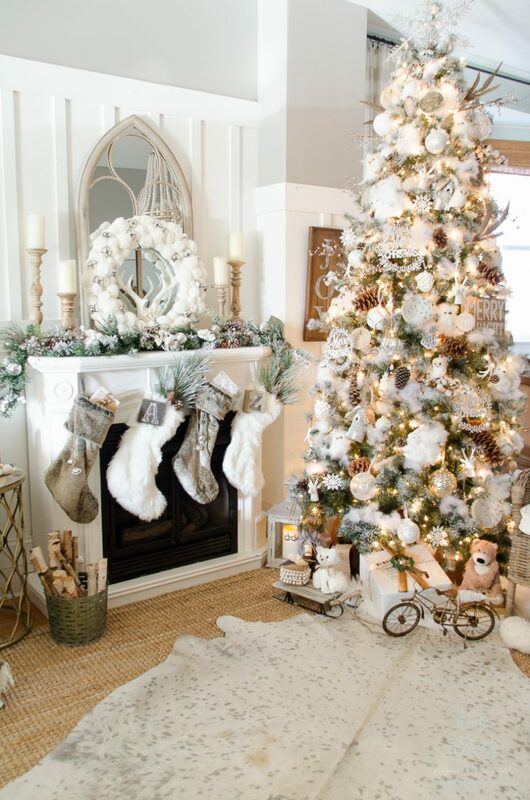 Choose your tree’s front focal point and order your decorations from this angle. Tip 4: Place ribbon or garland on the tree before the ornaments. This isn’t a hard-fast rule. If you decide to add ribbon or garland later on, you certainly can! However, for the safety of your ornaments it’s easiest to add your garland before the ornaments. Tip 5: Organize your ornaments on the floor before placing them on the tree. I have all of my ornaments organized by color in large plastic bins in our basement. When I want to decorate in all whites and silvers, all I have to do is grab the white and silver labeled bins! If you like to change your Christmas colors from year to year, I highly recommend putting away your ornaments by color. It will make your Christmas decorating so much easier. 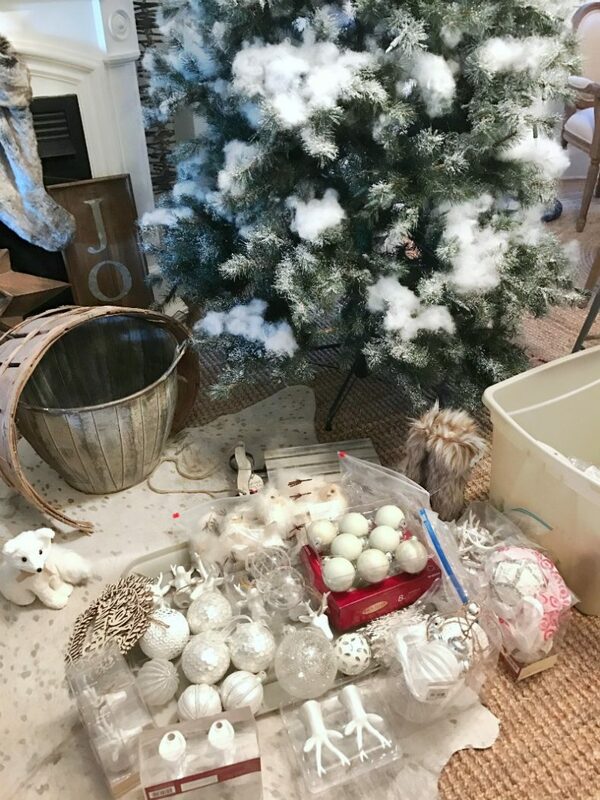 Likewise, organizing your ornaments on the floor before you begin decorating will help you assess what you already have, what you might want to buy, and what you might want to make. 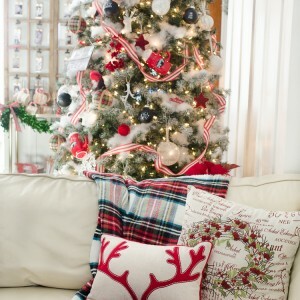 Tip 6: Place ornaments in a zig-zag pattern on your tree and get creative with large ornaments. Stagger your ornaments back and forth on your tree starting at your main focal point and working around the tree. Also don’t be scared to use non-ornaments on the tree. 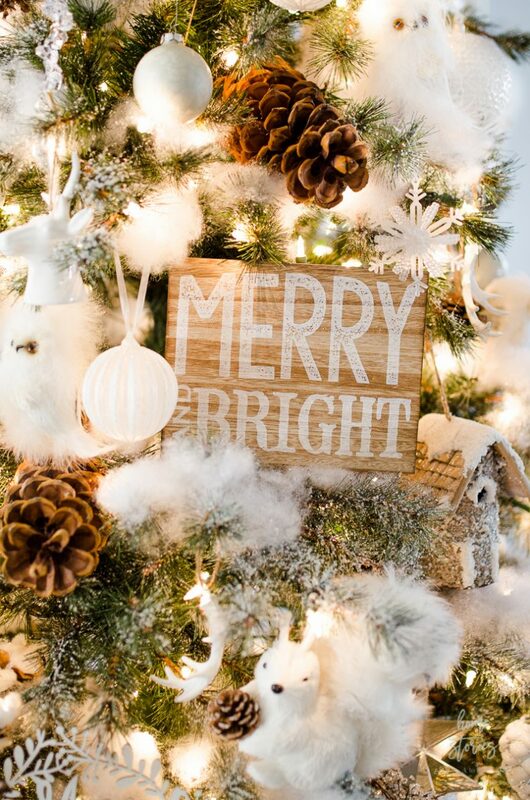 This cute Merry and Bright sign was found in the Target Dollar Spot and isn’t necessarily meant to be a tree ornament, but it looks great on the tree! Tip 7: Bring your color palette and theme to the surrounding area. 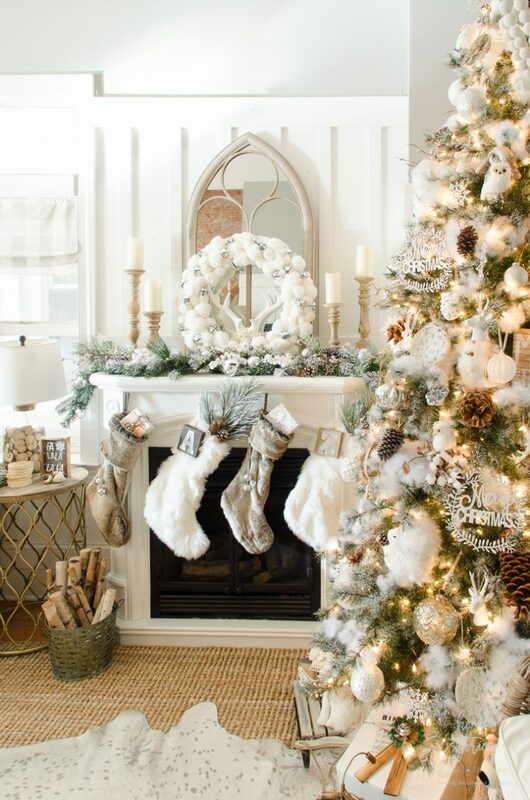 Decorating your mantel and surrounding room with the same theme and color palette will create a cohesive look. My pom-pom wreath and stockings (all from Home Goods) tie in my rustic farmhouse glam theme. 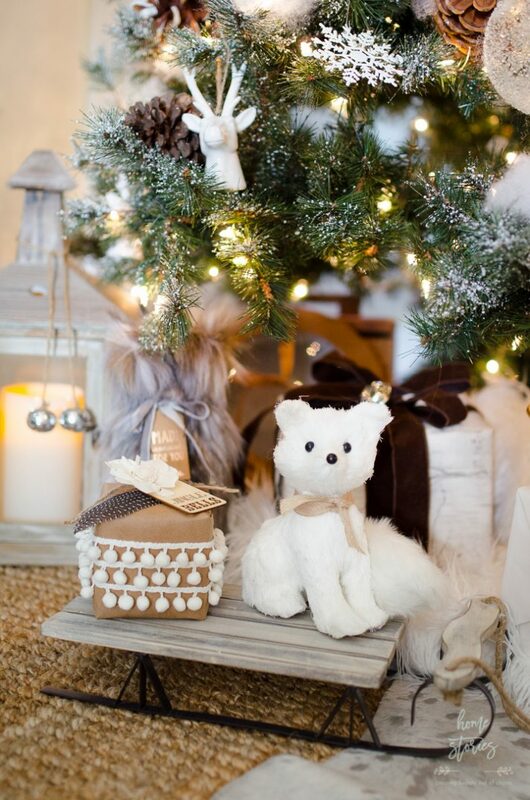 If you look closely on the tree, you will see that I used mini-embroidery hoops to create “furry” ornaments using craft fur and faux fur from a throw blanket. The rocking horse on the coffee table is from Amazon and I gave him an updated saddle with some craft fur. The A and Z stocking ornaments were found on clearance at Michaels. 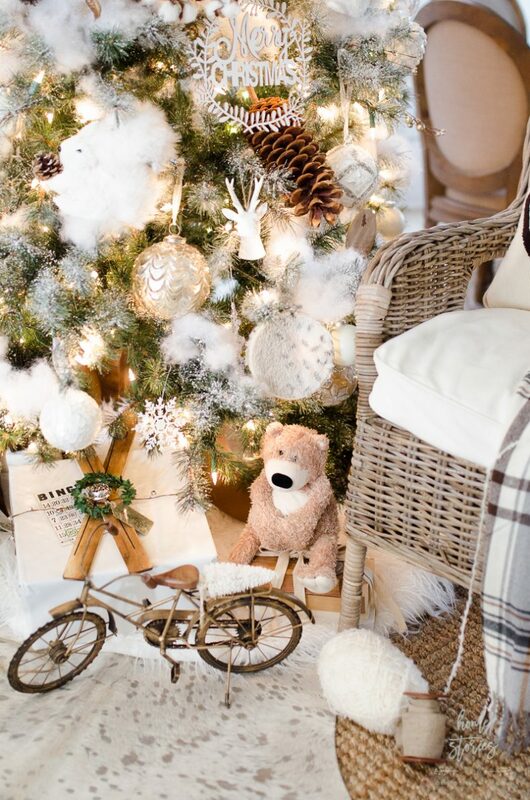 Tip 8: Use a blanket or basket instead of a tree skirt. I love the look of a Christmas tree in a woven or galvanized basket. If your tree stand is small enough, you can place your tree inside a basket or purchase a tree collar for your tree. I also like to use throw blankets instead of actual tree skirts. Since I decorate underneath my tree and place gifts all around, the tree skirt barely shows. This year I used a white faux fur throw as my tree skirt and it works perfectly. Tip 9: Decorate underneath your tree. Your wrapped gifts serve as gorgeous and inexpensive decorations! If you don’t have any of your Christmas gift shopping done yet, find things you have on hand that fit your theme and stick them at the base of your tree. An old teddy bear on a stack of books looks adorable and festive! I also like to use other little props from around the house to decorate under my tree. 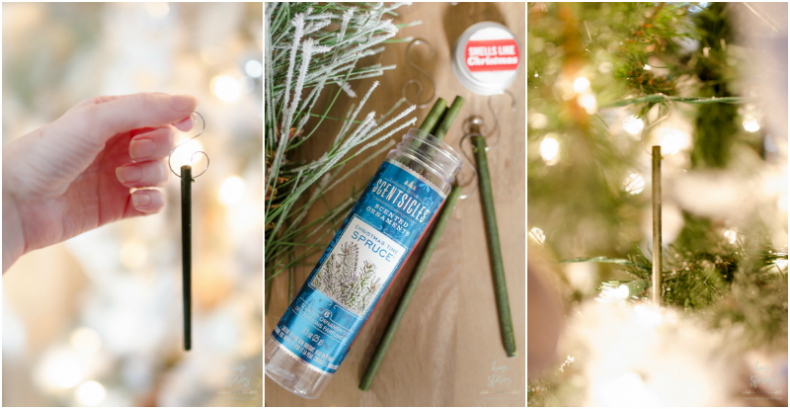 Tip 10: Use Scentsicles to make your tree smell like Christmas! 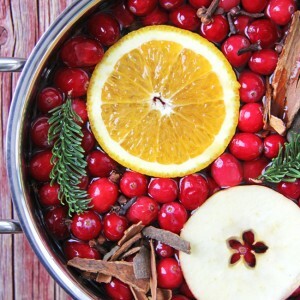 The aromas of Christmas are memories that stick with you. 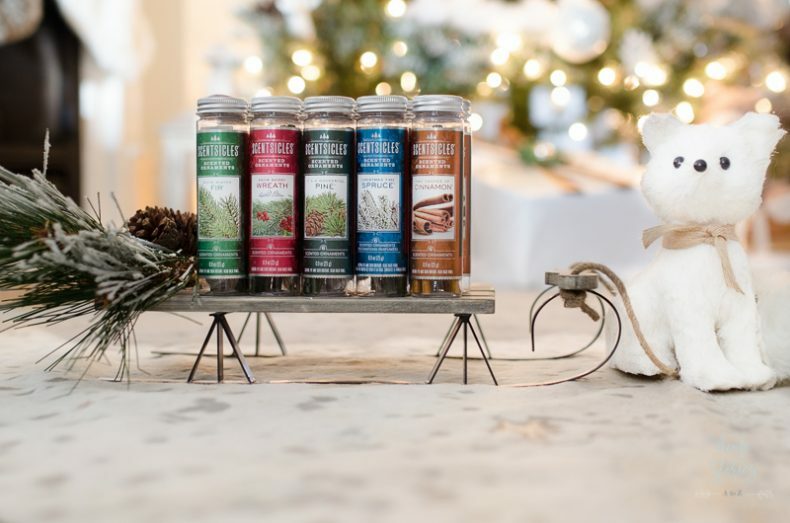 Whether it’s a pot of cinnamon and orange zest simmering on your mom’s stove, or your family room filled with fragrant pine, fragrance matters! The Christmas tree is central to so many of our holiday memories and should smell like a real Christmas tree – even if it’s artificial. Scentsicles are the finishing touch to your tree and are made from all-natural, sustainably managed paper products infused with pure, all-natural essential oils. They smell amazing and are safe to use. Choose your scent, place the ornament on the provided hook, hang on your tree and enjoy! Scentsicles come in a variety of fragrances that you can mix and match to craft your scent. Our family’s favorite Scentsicle fragrance is Spruce mixed with Cinnamon! 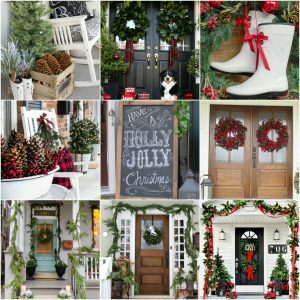 If you’re looking for more Christmas decorating inspiration, be sure to check out my related posts below! I’m so in love with your wood sign ornaments. May I know the measurement of it? Love your tree and your home decor. May I ask where that beautiful clock is from? What’s a beautiful tree!! I’d love to use some poly-fill batting on my artificial tree this year but my tree hasn’t no flocking whatsoevever. I think it would look weird with lots of snow piled on but no sprinkles of elsewhere. 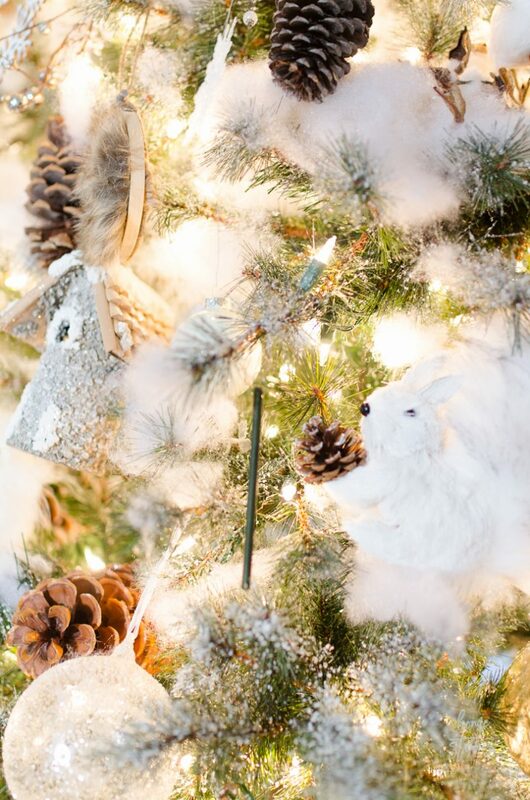 Did you flock your tree yourselves or buy it like that? Thanks! Love it all ! !1 Can you tell me the paint color on your walls behind the tree ? Thanks! It’s Sherwin Williams Dorian Gray. 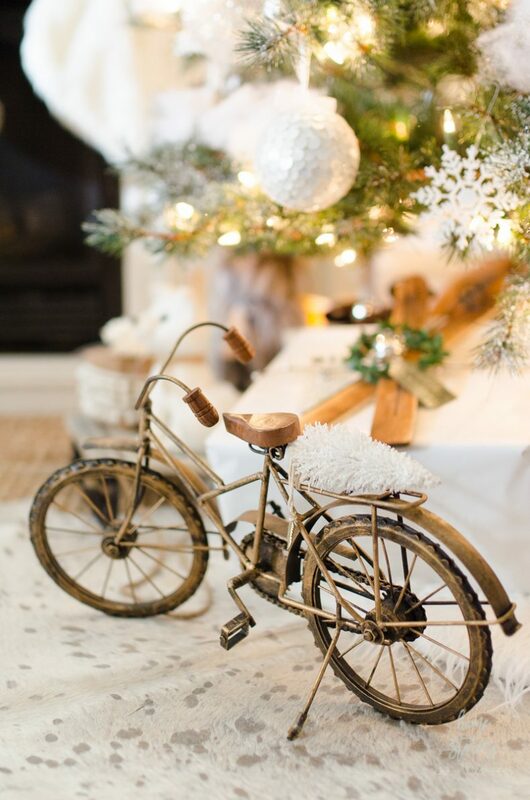 Your tree and home decor are picture perfect! What color ornaments did you use on your tree? 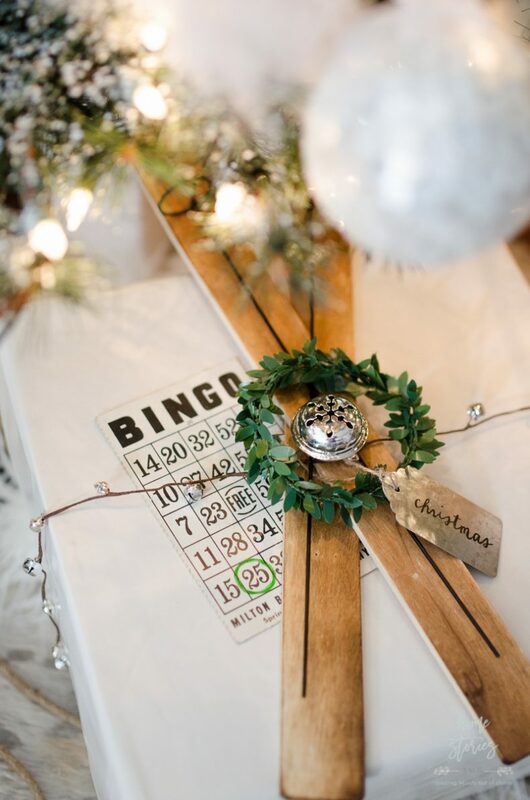 I’m so going to use your tree as Inspo and start following your blog! Thanks! They are from Michaels craft store. This is perfection! Everything is so beautiful! Your tree is so lovely, Beth! May I ask where you got the little white stuffed squirrel? Happiest of Holiday to you and your family. 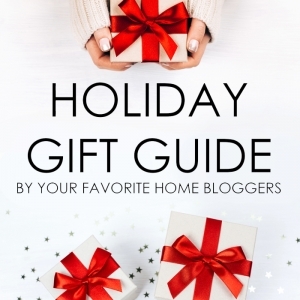 Wow, what a good guide, and easy to follow- thanks! Oh my this is so stunning. I need a new tree and this one is absolutely amazing. Beautiful room and post. This is my first time to your blog and I love this post (and many others!) I live in Australia now and recently saw the Scentsicles at one of the department stores here for a very reasonable $10. I’m wondering how well you think they scent? Are we talking the whole room or just when you’re really close to the tree? Thanks so much for the compliment and welcome to my blog! To answer your question, I think it all depends on how well you smell things (I’m very sensitive to smells) and how large an area you are trying to scent. We have a very open concept (think bowling alley) floor plan with 10 foot high ceilings. I used two packs of the Spruce–one on the tree and then the other on the mantel and coffee table–and I can smell them throughout the entire level. They smell great. I didn’t like the Fir scent when I initially smelled it, but if you’re at all familiar with essential oils sometimes a direct sniff is not the best indicator. You need to allow the smell to diffuse. I placed a few of the fir-scented sticks in our powder room, and it smells good in there but it’s a bit much. The space is very small, and I think 1 stick would suffice. Bottom line, I never recommend any products on my blog that I dislike and I would purchase these again. Maybe ask the store if they’d consider using a container as a tester so you can get a waft of the scent before purchasing? Spruce is my personal fav of the bunch followed by Cinnamon. Good luck Karen and thanks so much for the compliment! So warm, cozy and gorgeous. Would love to wake up christmas morning here. Can you tell me where you got your rug in the family room? Thank you! The rug is from RugsUSA purchased during one of their 75% off sales. It’s the Maui something or another rug. I can’t remember the exact name. 🙂 I love it. i love it Beth, its gorgeous. Great job! I tried to enter the contest but it wasn’t letting me submit it 🙁 I read it says on or about nov 11, so maybe its not just official yet?! I think you will be amazed at how much easier it is to decorate an artificial tree! I know I was. 🙂 And the Scentsicles definitely help me feel like it’s real.